Emerge America launches #WhySheRuns social media campaign to highlight real-life stories of women running for office as well as the need for more women in public office. Women make up more than half of our population, but we don’t even come close to that level of representation in our government. If we had more women running for office and serving in leadership roles, imagine how much more this country would get done. 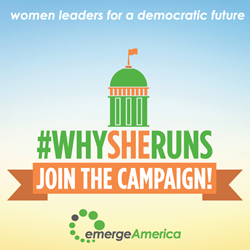 Today, Emerge America, the nation’s premier organization for recruiting and training Democratic women to run for office, launched #WhySheRuns, a social media campaign that will use the real-life stories of current and former women candidates and elected officials to spread the message of why our country needs more women to run for office and why women’s voices are so needed in government. The campaign also seeks to inspire women to jump into the political arena. Women who are interested in getting more information about running for office can sign up with Emerge America to get connected to resources. "Hillary Clinton's historic nomination as the first female presidential candidate of a major party has sparked important conversations about the role that women can and should play in government. This is an exciting time," said Andrea Dew Steele, Founder and President of Emerge America. "However, even if the highest glass ceiling is shattered in November, women will remain starkly underrepresented in government around the country. That's why we need to think of Hillary Clinton's achievement as the beginning of this journey, not the finish line. In order to make meaningful gains for equal representation, we have to work together and address the issue head-on." As part of today’s launch, Emerge America released a short video highlighting the campaign’s message and goals and featuring Emerge alumnae from across the country. It can be viewed at emergeamerica.org/whysheruns. A social media effort to start a conversation with potential candidates. Current and former women candidates and elected officials are encouraged to submit videos about why they ran for office on social media using the hashtag #WhySheRuns. Emerge will also release video clips from their social media accounts that the public is encouraged to share. Promotion of current female candidates for office. The campaign will highlight races of current standout women candidates for office and share their stories about why they are running). Emerge will spread the videos of candidates who post to social media. Targeted state-by-state recruitment. Emerge America’s state affiliates are currently recruiting their next classes of aspiring female politicians. For more information, please visit: emergeamerica.org/states. Connecting women to information and resources. For women who want to know more about running for office, Emerge America has created a page on their website where women can go to submit their information and get connected to resources. Others are also encouraged to nominate women they know to run. When it comes to politics, many women don’t know where to start. Emerge wants to help them be a force of change. More information is available at emergeamerica.org/whysheruns.